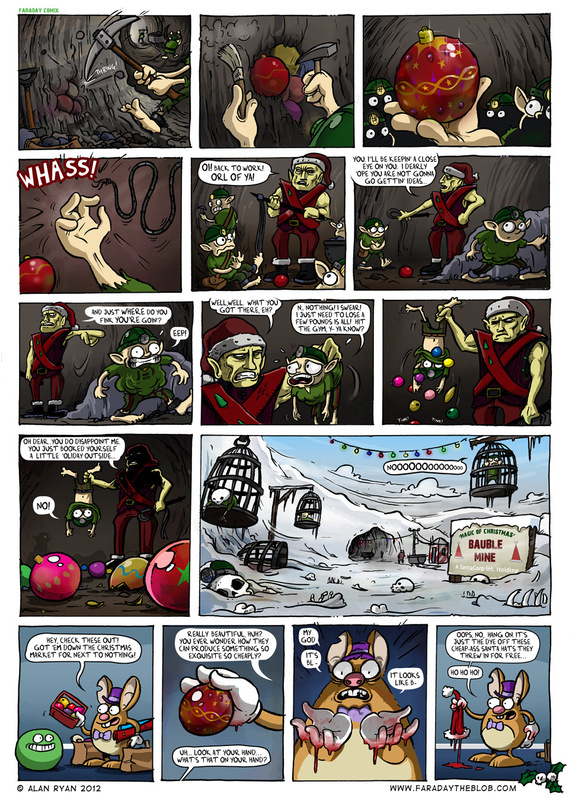 This entry was posted on Sunday, December 23rd, 2012 at 4:07 am and is filed under Comics. You can follow any responses to this entry through the RSS 2.0 feed. You can skip to the end and leave a response. Pinging is currently not allowed. The dye used in the hat, however, is blood. Cockney goblins dressed as michael jackson? At least the blood diamond market upcharges for the bloody process. Good old RSS. Well, this explains a lot. I don’t even want to think about the mistletoe supply side. Oh, drat, I just did. I have to go floss my brain now and that always turns into such a production. I can always count on Faraday the Blob to be most disturbing comic on the internet! @ Denny: It wouldn’t be Faraday the Blob if it weren’t disturbing. jajaja every new cartoon is an every new smile for me!